La vie Jaime : Calling all brides-to-be...visit the Natick Mall on August 19! Calling all brides-to-be...visit the Natick Mall on August 19! 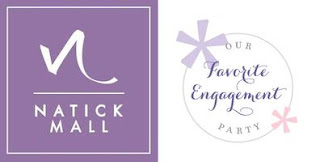 If you are in the Boston/Natick area and are engaged, be sure to head to the Natick Mall's Our Favorite Engagement Party this Saturday, August 19th. Together with Macy's, Sephora, and tons of other stores, they'll be hosting an afternoon filled with giveaways, complimentary refreshments & food, bridal makeup & fashion tips, and more. The couple of the hour will be Natick Mall's Shopper Search couple, Lauren and Matt. Funnily enough, these are my friends who's wedding I am attending this October (and her bachelorette I was just at in Newport)! I am so excited for them but bummed I cannot attend due to work travel. Their wedding will be featured on Style Me Pretty Massachusetts. For all the details, follow @NatickLauren, @NatickMatt, @ShopNatick and #engagementparty on Twitter, visit Natick Mall's Facebook, and RSVP on the event page! PS: This is open to any and everyone! So if you are planning a wedding this or next year, just simply obsessed with wedding blogs, and/or like free & fun things, be there! <3 Love you Lauren and Matt!! Congrats and I can't wait to celebrate with you! why is my name Sweet L?! Hah! gosh I SO wish I was in the boston area...who doesn't like free stuff...but I'm sorta on the opposite side of the country **sigh. Have so much fun! I loved these events for brides - congrats to your friends on the upcoming wedding and this fun party!